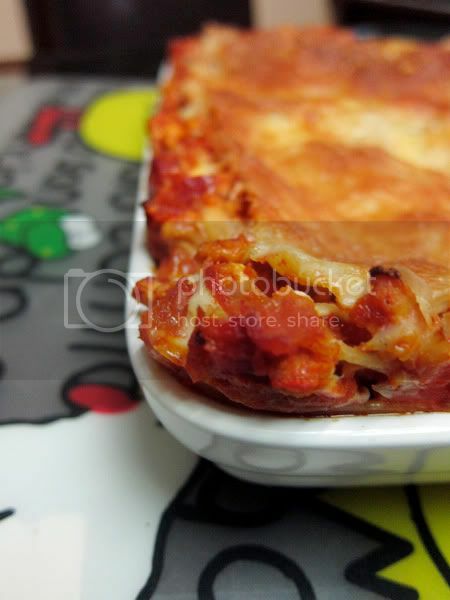 Lasagne is known as one of the best of comfort food; layers of pasta sheets, cheese sauce, tomatoy bolognese sauce, topped with parmesan cheese for that extra dose of cheeseyness. Ok I know that word don’t exist but you get what I mean. 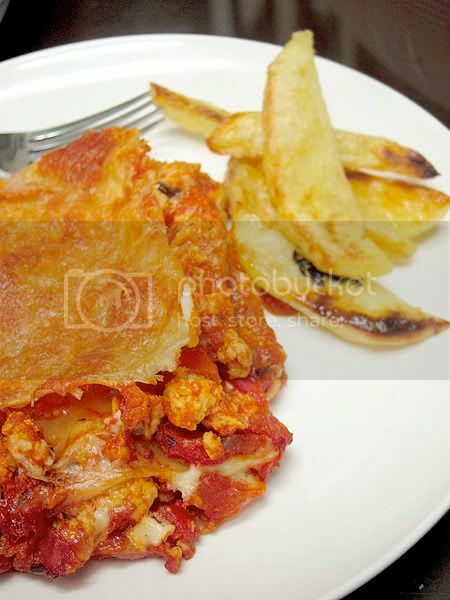 Despite lots of lasagne recipes out there, I still use this same recipe for old time’s sake, only except I used chicken mince instead of beef. The recipe is from Nora Sands’s Nora Dinners and breakfast, lunches and snacks for you to cook at home. If you’ve watched Jamie Oliver’s TV series; Jamie’s School Dinners, this woman would sound slightly familiar. Nora Sands, a dinner lady from Kidbrooke School in Greenwich became Jamie’s most powerful ally in the school dinner campaing, where they succeeded in getting the Government to undertake a massive U-turn on their social and nutritional policies for the kids in British schools. I’ve hardly came across the book here in the local bookstand, I’ll have to say, I actually won it from a giveaway when the book firstly launched. Hahaha how awesome is that..
First make the Bolognaise Sauce. Peel and chop carrot, onion and celery as small as you can, or rather dice them. Heat the frying pan over medium heat and add butter. Add in chopped carrot, onion and celery stirring occasionally with a wooden spoon. When veges have soften, add in minced meat and stir slowly for 3 minutes. Stir in tomato puree and add 200ml of the stock, and tin of chopped tomatoes. Add a pinch of salt and pepper. Bring to the boil, then turn the heat down and simmer with a lid on for 30-40 minutes. Make cheese sauce when bolognese sauce is ready. Melt butter in a small saucepan over low heat. add the flour and stir with wooden spoon until it becomes light and sandy colour. Gradually add milk, stirring all the time to make a smooth, thick sauce. If you pour in milk too quickly you may end up with lumps. If so, give it a good beat with a whisk to break them up. Leave to cook for a couple of minutes then add half the cheese and a little salt and pepper. 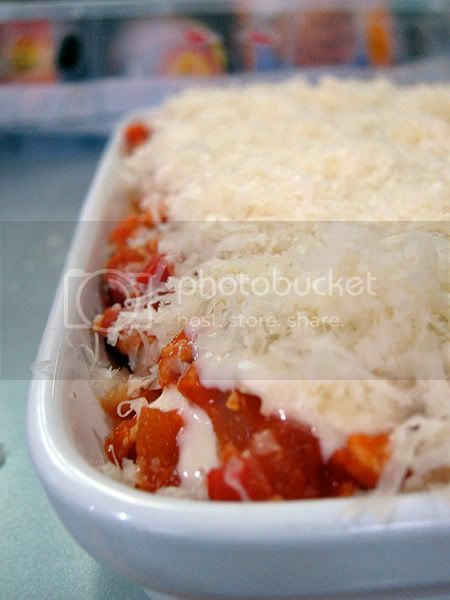 Line the bottom of baking dish with Bolognaise sauce. Top with a third of cheese sauce. Don’t mix together as you want it to be in layers. 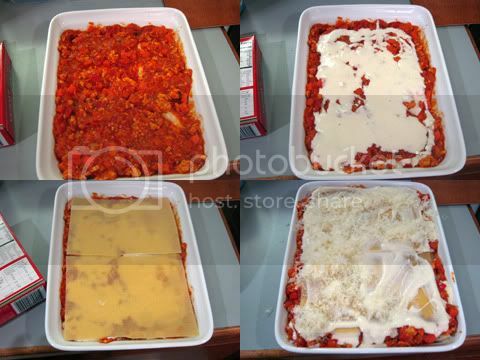 Lay half the pasta sheets over the sauce in one layer. Repeat by pouring more bolognese sauce, cheese and pasta sheet. 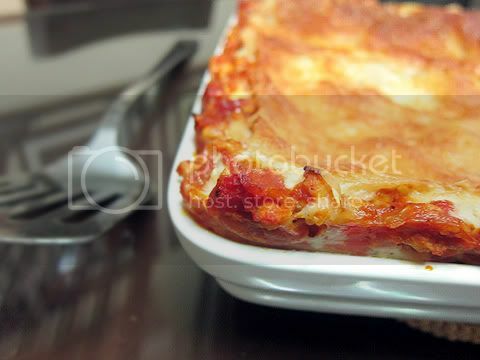 The top most layer should be a layer of cheese sauce on top of pasta sheet. Sprinkle with the rest of cheese. Bake in oven for 40 minutes, the sauces should be bubbling with some nice crispy bits at the side. For simple roast potato, I just boil potatoes for about 10 minutes, drain in colander. Then in a roasting tray, drizzle some olive oil then pour the potatoes into it. 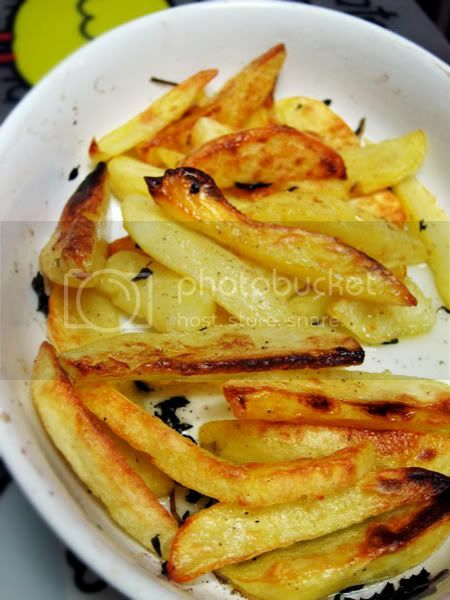 Bake for 20 minutes, then turn and toss the potatoes and bake further 15-20 minutes or till its golden brown. Add in some thyme or herbs for the extra deliciousness. Just a simple questions if you don’t mind. Dose it matter to use “tin tomatoes” or just fresh tomatoes from market?